What Can You Buy With the Average Social Security Check? Retirement can be an exciting start to a new life. With all of the hard work under your belt, it’s definitely worth getting there. Life as a retiree can offer many benefits, including a social security check. Budgeting for retirement is normally planned according to a person’s social security and their doled benefits. $1260 is the average American’s social security check’s sum. Now the question is, what can you buy with that? It’s unfortunately not enough to survive on, as it is not designed to sustain a standard of life but only to relinquish about forty percent of all the person’s total earnings. But, if one tries, it can be stretched enough to cover some necessary expenses. With that in mind, here are some things you can actually buy with an average American’s social security check. There are a number of cities in various states which easily allow you to rent an apartment on an average social security check for under $1000. Some cities, like El Paso, Texas, can even help stretch that check for two months with rents as low as $500. Other cities like Cincinnati, Columbus, Ohio, Waterbury, Connecticut, and Boise, Idaho offer cheap rents that help massively support one living on the check. 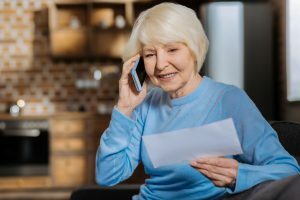 If someone is entirely dependent on their social security check for their income, then spending less money has to be implemented to successfully cope with expenses. According to survey estimates, $265 is the amount spent on groceries each month by 65 year olds and older. If this is the case, the average social security check can last more than four months for supplies. Even with these figures, eating out is a doable notion. By going out for lunch instead of dinner or taking advantage of deals, visiting restaurants is not out of your range of options. The Apple iPhone X is out and strung with a retail price of $999, which makes it affordable to some. However, there are so many other options available that are much less expensive. It’s notable to state that the costs don’t cover cellular charges so that has to be kept in mind. With the average social security check, though, it can be covered along with the cost of the phone. And, needless to add, the phone is worth the money if you don’t need the check as other vitals are covered and looked after. If you are not set in other vital aspects of your life, then buying such an expensive phone is a disastrous idea. Instead, go for a $50 phone with a cellular package of $20 per month from Consumer Cellular. This check can cover your cellular expenses for at least a year. Some states, like Ohio and West Virginia, offer the lowest monthly mortgage payments in the country. And in these states, an average social security check can even pay for a mortgage. It is, however, limited to twenty-eight percent of your income so monthly payment plans can look like $352 a month. By covering other expense, the $1260 can even pay the mortgage and offer other securities like groceries and transport fares. However, it’s a wise decision to back one up with double the social security paycheck just to be on the safe side and think practically. Part A Medicare Insurance is covered under the policy if anyone possesses more than forty work credit quarters. Part B, however, is not. Depending on the income or earnings of an individual or the average social security check, it can vary. It is at least $135 per month. Part B has services such as lab tests or wheelchair assistance and supplies. A yearly deduction of about $185 will be required, after which twenty percent is paid for covered services. Are you ready for two rounds of blissful golf at the beautiful Pebble Beach, California? If you are a golf enthusiast, your social security check can last for about a couple of rounds there with some much needed relaxing golf, if you can afford it. From your check of about $1260, approximately $625 of your average social security check would enable you to play two fine rounds of the sport you love. These costs are included with a caddie and a cart. That being said, it’s an experience not to be easily forgotten but it’s not the best use of the monthly paycheck that helps you get by month to month. Although, if all other financial aspects are covered, a game of golf does the heart and mind good! https://www.completecontroller.com/wp-content/uploads/cclogo_main-long-300x63.png 0 0 Complete Controller https://www.completecontroller.com/wp-content/uploads/cclogo_main-long-300x63.png Complete Controller2019-03-19 03:35:092019-03-20 09:18:00What Can You Buy With the Average Social Security Check?